The Zebra ZXP Series 1 Black Monochrome Ribbon (Item #: 800011-101) has been designed to print sharp text and clear monochrome images or barcodes in black on all your ID cards and badges. This ribbon is only compatible with the Zebra ZXP Series 1 card printers. Personalize pre-printed cards or create perfect monochrome badges with this easy-to-use monochrome ribbon. The Zebra ZXP Series 1 Black Monochrome Ribbon benefits from Zebra’s Load-N-Go™ technology that allows you to simply drop the ribbon in the printer to install it. Your printer will automatically detect and authenticate the ribbon. Each ribbon also includes a cleaning roller for easy maintenance. Eco-friendly, the Zebra ZXP Series 1 black monochrome ribbon uses less plastic and more biodegradable material than many competing brands. 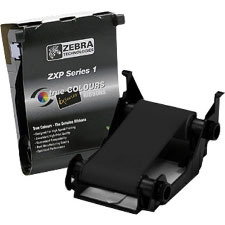 The Zebra ZXP Series 1 Black Monochrome Ribbon can print up to 1,000 images per roll.